a. Literary Arabic is the sole official language. Egyptian Arabic is the national spoken language. Other dialects and minority languages are spoken regionally. Egypt, officially the Arab Republic of Egypt, is a country in North Africa that includes the Sinai Peninsula, a land bridge to Asia. Egypt is one of the most populous countries in Africa. The vast majority of its approximately 80 million people live near the banks of the Nile River where the only arable agricultural land is found. Large areas are part of the Sahara Desert and are sparsely inhabited. Around half of Egypt's residents live in urban areas. Egypt is famous for its ancient civilization and some of the world's most famous monuments, including the Pyramids of Giza and the Great Sphinx; the southern city of Luxor contains a particularly large number of ancient artifacts such as the Karnak Temple and the Valley of the Kings. Today, Egypt is widely regarded as an important political and cultural center of the Middle East. It was the first Arab state to establish diplomatic relations with Israel, after the signing of the Egypt-Israel Peace Treaty. Egypt has a major influence among other Arab states and has historically played an important role as a mediator in resolving disputes between various Arab states and in the Israeli-Palestinian dispute. Egypt borders Libya to the west, Sudan to the south, the Gaza Strip and Israel to the east. The northern coast borders the Mediterranean Sea and the eastern coast borders the Red Sea. Egypt's important role in geopolitics stems from its strategic position: A transcontinental nation, it possesses a land bridge (the Isthmus of Suez) between Africa and Asia, which in turn is traversed by a navigable waterway (the Suez Canal) that connects the Mediterranean Sea with the Indian Ocean via the Red Sea. At 386,636 square miles (1,001,450 km²), Egypt is the world's thirtieth-largest country (after Mauritania). It is comparable in size to Tanzania, twice the size of France, and is more than half the size of the U.S. state of Alaska. 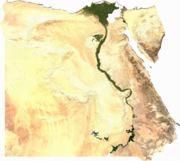 Nevertheless, due to the aridity of Egypt's climate, population centers are concentrated along the narrow Nile Valley and Delta, meaning that approximately 99 percent of the population uses only about 5.5 percent of the total land area. Apart from the Nile Valley, the majority of Egypt's landscape is a big, sandy desert. The winds blowing can create sand dunes over one hundred feet high. Egypt includes parts of the Sahara Desert and of the Libyan Desert. These deserts were referred to as the "red land" in ancient Egypt, and they protected the Kingdom of the Pharaohs from western threats. Towns and cities include Alexandria, one of the greatest ancient cities, Aswan, Asyut, Cairo, the modern Egyptian capital, El-Mahalla El-Kubra, Giza, the site of the Pyramid of Khufu, Hurghada, Luxor, Kom Ombo, Port Safaga, Port Said, Sharm el Sheikh, Suez, where the Suez Canal is located, Zagazig, and Al-Minya. Oases include Bahariya, el Dakhla, Farafra, el Kharga, and Siwa. Protectorates include Ras Mohamed National Park, Zaranik Protectorate and Siwa. Egypt receives the least rainfall of any country in the world. South of Cairo, rainfall averages only around 0.1 to 0.2 inches (2 to 5 mm) per year and at intervals of many years. On a very thin strip of the northern coast the rainfall can be as high as 7 inches (170 mm), all between November and March. Snow falls on Sinai's mountains and some of its middle and coastal cities. Egypt relies on the Nile River for water. Temperatures average between 80 and 90°F (27-32°C) in summer, and up to 109°F (42°C) on the Red Sea coast. Temperatures average between 55 and 70°F (13-21°C) in winter. A steady wind from the northwest helps hold down the temperature near the Mediterranean coast. 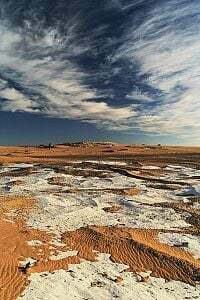 The Khamaseen is a wind that blows from the south in Egypt, usually in spring or summer, bringing sand and dust; it sometimes raises the temperature in the desert to more than 100°F (38°C). The Nile Valley has been a site of continuous human habitation since at least the Paleolithic era. Evidence of this appears in the form of artifacts and rock carvings along the Nile terraces and in the desert oases. In the tenth millennium B.C.E., a culture of hunter-gatherers and fishers replaced a grain-grinding culture. Climate changes and/or overgrazing around 8000 B.C.E. began to desiccate the pastoral lands of Egypt, eventually forming the Sahara Desert. Early tribal peoples migrated to the Nile River, where they developed a settled agricultural economy and more centralized society. By about 6000 B.C.E., organized agriculture and large building construction had appeared in the Nile Valley. During the Neolithic, several predynastic cultures developed independently in Upper and Lower Egypt, remaining somewhat culturally separate but maintaining frequent contact through trade. A unified kingdom was founded c. 3150 B.C.E. by King Menes, giving rise to a series of dynasties that ruled Egypt for the next three millennia. 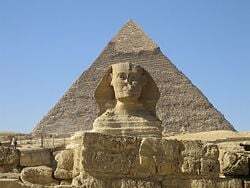 Egyptian culture flourished during this long period and remained distinct in its religion, arts, language, and customs. The first two ruling dynasties of a unified Egypt set the stage for the Old Kingdom period (c. 2700−2200 B.C.E. ), famous for its many pyramids. The Great Sphinx and the Pyramids of Giza, built during the Old Kingdom, are modern national icons that also lie at the heart of Egypt's thriving tourism industry. The First Intermediate Period ushered in a time of political upheaval for about 150 years. Stronger Nile floods and stabilization of government, however, brought back renewed prosperity for the country in the Middle Kingdom c. 2040 B.C.E., reaching a peak during the reign of Pharaoh Amenemhat III. A second period of disunity heralded the arrival of the first foreign ruling dynasty in Egypt, that of the Semitic Hyksos. The Hyksos invaders took over much of Lower Egypt around 1650 B.C.E. 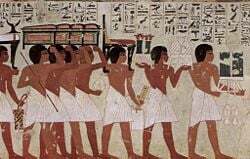 They were eventually driven out by an Upper Egyptian force led by Ahmose I, who founded the Eighteenth Dynasty and relocated the capital from Memphis to Thebes. The New Kingdom (c. 1550−1070 B.C.E.) began with the Eighteenth Dynasty, marking the rise of Egypt as an international power that expanded during its greatest extension to an empire as far south as Jebel Barkal in Nubia and included parts of the Levant in the east. This period is known for some of the best-known Pharaohs, including Hatshepsut, Thutmose III, Akhenaten and his wife Nefertiti, Tutankhamun, and Ramesses II. The first known self-conscious expression of monotheism came during this period in the form of Atenism. Frequent contacts with other nations brought in new ideas during the New Kingdom. The country was later invaded by Libyans, Nubians, and Assyrians, but native Egyptians drove them out and regained control of their country. 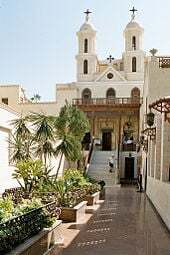 First built in the third or fourth century C.E., the Hanging Church is Cairo's most famous Coptic church. The Thirtieth Dynasty was the last native ruling dynasty during the Pharaonic epoch. It fell to the Persians in 343 B.C.E. after the last native Pharaoh, King Nectanebo II, was defeated in battle. Later, Egypt fell to the Greeks and Romans, beginning over two thousand years of foreign rule. Before Egypt became part of the Byzantine realm, Christianity had been brought by Saint Mark the Evangelist in the first century. Diocletian's reign marks the transition from the Roman to the Byzantine era in Egypt, when a great number of Egyptian Christians were persecuted. The New Testament was by then translated into Egyptian, and after the Council of Chalcedon in 451, a distinct Egyptian Coptic Church was firmly established. The Byzantines were able to regain control of the country after a brief Persian invasion early in the seventh century, until Egypt was invaded in 639, by the Muslim Arabs. The form of Islam the Arabs brought to Egypt was Sunni, though early in this period Egyptians began to blend their new faith with indigenous beliefs and practices that had survived through Coptic Christianity, giving rise to various Sufi orders that have flourished to this day. Muslim rulers nominated by the Islamic Caliphate remained in control of Egypt for the next six centuries, including a period for which it was the seat of the Caliphate under the Fatimids. With the end of the Ayyubid dynasty, a Turco-Circassian military caste, the Mamluks, took control around 1250 and continued to govern even after the conquest of Egypt by the Ottoman Turks in 1517. 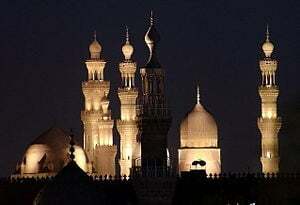 Mosque of Mohamed Ali built in the early nineteenth century within the Cairo Citadel. The brief French invasion of Egypt led by Napoleon Bonaparte in 1798 had a great social impact on the country and its culture. Native Egyptians became exposed to the principles of the French Revolution and had an apparent chance to exercise self-governance. A series of civil wars took place between the Ottoman Turks, the Mamluks, and Albanian mercenaries following the evacuation of French troops, resulting in the Albanian Muhammad Ali (Kavalali Mehmed Ali Pasha) taking control of Egypt, where he was appointed as the Ottoman viceroy in 1805. He led a modernization campaign of public works, including irrigation projects, agricultural reforms, and increased industrialization, which were then taken up and further expanded by his grandson and successor, Isma'il Pasha. Following the completion of the Suez Canal by Ismail in 1869, Egypt became an important world transportation hub. In 1866, the Assembly of Delegates was founded to serve as an advisory body for the government. Its members were elected from across Egypt and eventually they came to have an important influence on governmental affairs. The country also fell heavily into debt to European powers. Ostensibly to protect its investments, the United Kingdom seized control of Egypt's government in 1882. Nominal allegiance to the Ottoman Empire continued, however, until 1914. As a result of the outbreak of World War I, Britain declared a protectorate over Egypt and deposed the Khedive Abbas II, replacing him with his uncle, Husayn Kamil, who was appointed sultan. Between 1882 and 1906, a local nationalist movement for independence had been taking shape and the first political parties were founded. With the end of World War I, Saad Zaghlul and the Wafd Party led the Egyptian nationalist movement after gaining a majority in the local Legislative Assembly. When the British exiled Zaghlul and his associates to Malta in 1919, Egypt witnessed its first modern revolution. Constant revolting by the Egyptian people throughout the country led Great Britain to issue a unilateral declaration of Egypt's independence on February 22, 1922. The new Egyptian government drafted and implemented a new constitution, in 1923, based on a parliamentary representative system. Saad Zaghlul was popularly elected as prime minister of Egypt in 1924, and in 1936 the Anglo-Egyptian Treaty was concluded. Continued instability in the government due to remaining British control and increasing political involvement by the king led to the ouster of the monarchy and the dissolution of the parliament in a military coup d'état known as the 1952 Revolution. The officers, known as the Free Officers Movement, forced King Farouk to abdicate in support of his son Fuad. Evening view of Cairo, the largest city in Africa and the Middle East. The Cairo Opera House (center) is the main performing arts venue in the Egyptian capital. The Egyptian Republic was declared on June 18, 1953, with General Muhammad Naguib as the first president. Naguib was forced to resign in 1954 by Gamal Abdel Nasser—the real architect of the 1952 movement—and was later put under house arrest. Nasser assumed power as president and declared the full independence of Egypt from the United Kingdom on June 18, 1956. His nationalization of the Suez Canal on July 26, 1956, prompted the 1956 Suez Crisis. Three years after the 1967 Six Day War, in which Israel had invaded and occupied the Sinai Peninsula, Nasser died and was succeeded by Anwar Sadat. Sadat switched Egypt's Cold War allegiance from the Soviet Union to the United States, expelling Soviet advisers in 1972, and launched an economic reform policy, while violently clamping down on religious and secular opposition alike. In 1973, Egypt, along with Syria, launched the October War, a surprise attack against the Israeli forces occupying the Sinai Peninsula and the Golan Heights in an attempt to liberate the territory Israel had captured six years earlier. Both the United States and the Soviet Union intervened, and a cease-fire was reached between both sides. Despite not being a complete military success, most historians agree that the October War presented Sadat with a political victory that would later allow him to pursue peace with Israel. In 1977, Sadat made a historic visit to Israel that led to the 1978 Camp David Accords in exchange for the complete Israeli withdrawal from Sinai. Sadat's initiative sparked enormous controversy in the Arab world and led to Egypt's expulsion from the Arab League but was supported by the vast majority of Egyptians. Sadat was assassinated in Cairo by a fundamentalist soldier in 1981, and was succeeded by the incumbent, Hosni Mubarak. In 2003, the Egyptian Movement for Change, popularly known as Kifaya, was launched to seek a return to democracy and greater civil liberties. In early 2011, Egypt underwent a revolution, which resulted in the ousting of President Hosni Mubarak after nearly 30 years in power. Mohamed Hussein Tantawi, chairman of the Supreme Council of the Armed Forces, became the de facto interim head of state. In February 2011, the military dissolved the parliament and suspended the constitution. A constitutional referendum was held on March 19, 2011, and on November 28, 2011 Egypt held its first parliamentary election since the previous regime had been in power. Mohamed Morsi was elected president and took office on June 24, 2012. On August 2, 2012, Egypt's Prime Minister Hisham Qandil announced his 35 member cabinet comprising 28 newcomers, including four from the Muslim Brotherhood, a move which led to serious concerns that they would impose strict Islamic practices. On July 3, 2013, the military removed Morsi and his Muslim Brotherhood supporters from power in a coup d'etat and installed an interim government. On January 18 2014, the interim government instituted a new constitution following a referendum in which 98.1 percent of voters were supportive. On March 26 2014 Abdel Fattah el-Sisi the head of the Egyptian Armed Forces, who at this time was in control of the country, resigned from the military, announcing he would stand as a candidate in the 2014 presidential election. The poll, held between 26 and 28 May 2014, resulted in a landslide victory for el-Sisi, who was sworn into office as President of Egypt on June 8, 2014. Egypt has been a republic since June 18, 1953. Although power is ostensibly organized under a multi-party semi-presidential system, whereby the executive power is theoretically divided between the president and the prime minister, in practice it rested almost solely with the president, who traditionally was elected in single-candidate elections. In 2005, then President Mubarak announced in a surprise television broadcast that he had ordered the reform of the country's presidential election law, paving the way for multi-candidate polls in the upcoming presidential election. For the first time since the 1952 movement, the Egyptian people had an apparent chance to elect a leader from a list of various candidates. However, the new law placed draconian restrictions on the filing for presidential candidacies, designed to prevent well-known candidates such as Ayman Nour from standing against Mubarak, and paved the road for his easy re-election victory. Concerns were once again expressed after the 2005 presidential elections about government interference in the election process through fraud and vote-rigging, in addition to police brutality and violence by pro-Mubarak supporters against opposition demonstrators. As a result, most Egyptians remain skeptical about the process of democratization and the role of the elections. The legal system is based on Islamic and civil law (particularly Napoleonic codes); judicial review is by the Supreme Court and Council of State (which oversees the validity of administrative decisions). Several local and international human rights organizations, including Amnesty International and Human Rights Watch, have for many years criticized Egypt's human rights record as poor. In 2005, President Hosni Mubarak faced unprecedented public criticism when he clamped down on democracy activists challenging his rule. Some of the most serious human rights violations, according to HRW's 2006 report on Egypt, are routine torture, arbitrary detentions, and trials before military and state security courts. In September 2007, four newspaper editors were sentenced to a year in prison and fines for criticizing the country's top political leaders. Discriminatory personal status laws governing marriage, divorce, custody, and inheritance that put women at a disadvantage have also been cited. Laws concerning Christians that place restrictions on church building and open worship have been eased recently, but major constructions still require governmental approval and persecution of Christianity by underground radical groups remains a problem. In addition, intolerance of Baha'is and unorthodox Muslim sects remains a problem. The high court of Egypt has outlawed all religions and beliefs except Islam, Christianity, and Judaism. Egypt is a transit country for women trafficked from Eastern Europe to Israel for the purpose of sexual exploitation; these women generally arrive as tourists and are subsequently trafficked through the Sinai Desert by Bedouin tribes; men and women from Sub-Saharan Africa and Asia are believed to be trafficked through the Sinai Desert to Israel and Europe for labor exploitation; some Egyptian children from rural areas are trafficked within the country to work as domestic servants or laborers in the agriculture industry. The Egyptian armed forces have a combined troop strength of around 450,000 active personnel. The air force is estimated to have roughly the same number of modern warplanes as the Israeli air force and in general the military has far more Western tanks, artillery, anti-aircraft batteries, and warships than the Israeli Defense Force. The Egyptian military has recently undergone a massive modernization, mostly of the air force. Egypt is the first country in the region with a spy satellite, EgyptSat 1, and is planning to launch three more spy satellites. Factors such as population size, historical events, military strength, diplomatic expertise, and a strategic geographical position give Egypt extensive political influence in Africa and the Middle East. Cairo has been a crossroads of regional commerce and culture for centuries, and its intellectual and Islamic institutions are at the center of the region's social and cultural development. The permanent headquarters of the Arab League is located in Cairo, and the secretary general of the League has traditionally been an Egyptian. The Arab League briefly moved out of Egypt to Tunis, in 1978, as a protest at the peace treaty with Israel, but it returned in 1989. Egypt was the first Arab state to establish diplomatic relations with the state of Israel, after the signing of the Egypt-Israel Peace Treaty. Egypt has a major influence among other Arab states and has historically played an important role as a mediator in resolving disputes between various Arab states and in the Israeli-Palestinian dispute. Most Arab nations still give credence to Egypt playing that role, though its effects are often limited and recently challenged by ambitious Saudi Arabia and oil-rich Gulf states. Egypt is a transit point for cannabis, heroin, and opium moving to Europe, Israel, and North Africa as well as a transit stop for Nigerian drug couriers. There is international concern that it is a money laundering site due to lax enforcement of financial regulations. Egypt's economy depends mainly on agriculture, media, petroleum exports, and tourism. There are also more than three million Egyptians working abroad, mainly in Saudi Arabia, the Persian Gulf, and Europe. 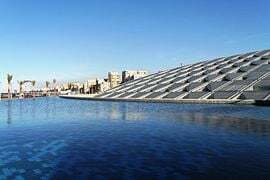 The completion of the Aswan High Dam in 1971 and the resultant Lake Nasser have altered the time-honored place of the Nile River in the agriculture and ecology of Egypt. A rapidly growing population, limited arable land, and dependence on the Nile all continue to overtax resources and stress the economy. In the last thirty years, the government has reformed the highly centralized economy it inherited from President Nasser. In 2005, Prime Minister Ahmed Nazif reduced personal and corporate tax rates, reduced energy subsidies, and privatized several enterprises. The stock market boomed, and GDP grew about 5 percent per year in 2005-06. Despite these achievements, the government has failed to raise living standards for the average Egyptian, and has had to continue providing subsidies for basic necessities. The subsidies have contributed to a growing budget deficit—more than 10 percent of GDP each year—and represent a significant drain on the economy. To achieve higher GDP growth the government will need to continue its aggressive pursuit of reform, especially in the energy sector. The government has struggled to prepare the economy for the new millennium through economic reform and massive investments in communications and physical infrastructure. Egypt has been receiving U.S. foreign aid (since 1979, an average of $2.2 billion per year) and is the third-largest recipient of such funds from the United States. Its main revenues, however, come from tourism as well as traffic that goes through the Suez Canal. Egypt has a developed energy market based on coal, oil, natural gas, and hydro power. Substantial coal deposits are found in the northeast Sinai and are mined at the rate of about 600,000 tons per year. Oil and gas are produced in the western desert regions, the Gulf of Suez, and the Nile Delta. Egypt has huge reserves of gas, estimated at over 1.1 million cubic meters in the 1990s, and LNG is exported to many countries. Economic conditions have started to improve considerably after a period of stagnation from the adoption of more liberal economic policies by the government, as well as increased revenues from tourism and a booming stock market. 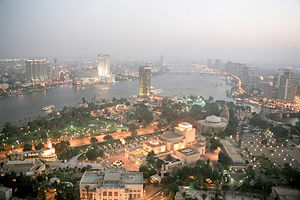 In its annual report, the IMF has rated Egypt as one of the top countries in the world undertaking economic reforms. Some major economic reforms taken by the new government since 2003 include a dramatic slashing of customs and tariffs. A new taxation law implemented in 2005 decreased corporate taxes from 40 to 20 percent, resulting in a stated 100 percent increase in tax revenue by the year 2006. GDP per capita is $4,200 (2006 est.). Foreign direct investment (FDI) into Egypt has increased considerably in the past few years due to the recent economic liberalization measures, exceeding $6 billion in 2006. Egypt was slated to overcome South Africa as the highest earner of FDI in Africa in 2007. Although one of the main obstacles still facing the Egyptian economy is the trickle down of wealth to the average population, many Egyptians criticize their government for higher prices of basic goods while their standards of living or purchasing power remains relatively stagnant. Often corruption is blamed by Egyptians as the main impediment to feeling the benefits of the newly attained wealth. Major reconstruction of the country's infrastructure is promised by the government, with a large portion of the sum paid for the newly acquired third mobile license ($3 billion) by Etisalat. This is slated to be pumped into the country's railroad system, in response to public outrage against the government for disasters, in 2006, that claimed more than a hundred lives. The IT sector has been expanding rapidly in the past few years, with many new start-ups conducting outsourcing business to North America and Europe, operating with companies such as Microsoft, Oracle, and other major corporations. The sector has been stimulated by new Egyptian entrepreneurs trying to capitalize on their country's huge potential in the sector, as well as constant government encouragement. Exports—commodities: Crude oil and petroleum products, cotton, textiles, metal products, chemicals. Export partners: Italy 12.2 percent, U.S. 11.4 percent, Spain 8.6 percent, UK 5.6 percent, France 5.4 percent, Syria 5.2 percent, Saudi Arabia 4.4 percent, and Germany 4.2 percent (2006). Imports: machinery and equipment, foodstuffs, chemicals, wood products, fuels Import partners: U.S. 11.4 percent, China 8.2 percent, Germany 6.4 percent, Italy 5.4 percent, Saudi Arabia 5 percent, France 4.6 percent (2006). Economy GDP (2005 est. ): $303 billion. Annual growth rate (2005 est. ): 4.8 percent. Per capita GDP (2005 est. ): $4,282. Natural resources: Petroleum and natural gas, iron ore, phosphates, manganese, limestone, gypsum, talc, asbestos, lead, zinc. Agriculture: Products—cotton, rice, onions, beans, citrus fruits, wheat, corn, barley, sugar. Industry: Types—food processing, textiles, chemicals, petrochemicals, construction, light manufacturing, iron and steel products, aluminum, cement, military equipment. Trade (FY 2005): Exports—$14.3 billion: Petroleum, clothing and textiles, cotton, fruits and vegetables, manufactured goods. Major markets—European Union, U.S., Middle East, Japan. Imports—$24.1 billion: Machinery and transport equipment, petroleum products, livestock, food and beverages, paper and wood products, chemicals. Major suppliers—EU, U.S., Japan. Egypt is the most populous country in the Arab world and the second-most populous on the African Continent. Nearly all of the country's 80 million people live in Cairo and Alexandria; elsewhere on the banks of the Nile River; in the Nile delta, which fans out north of Cairo; and along the Suez Canal. These regions are among the world's most densely populated, containing an average of over 3,820 persons per square mile (1,540 per sq. km. ), compared to 181 persons per square mile for the country as a whole. Small communities spread throughout the desert regions of Egypt are clustered around oases and historic trade and transportation routes. The government has tried with mixed success to encourage migration to newly irrigated land reclaimed from the desert. The proportion of the population living in rural areas has continued to decrease, however, as people move to the cities in search of employment and a higher standard of living. Approximately 90 percent of the population adheres to Islam and most of the remainder to Christianity (primarily the Coptic Orthodox denomination). Apart from religious affiliation, Egyptians can be divided demographically into those who live in the major urban centers and the fellahin, or farmers of rural villages. The last forty years have seen a rapid increase in population due to medical advances and massive increases in agricultural productivity. Life expectancy is 72 years. The overall literacy rate for the total population is 71.4 percent (males 83 percent and females 59 percent). Education is free through university and compulsory from ages six through fifteen. Attendance rates for primary and secondary education have strengthened in recent years, and 93 percent of children enter primary school today. Major universities include Cairo University (100,000 students), Alexandria University, and the thousand-year-old Al-Azhar University, one of the world's major centers of Islamic learning. Egypt also hosts an unknown number of refugees and asylum seekers. According to the UNDP's 2004 Human Development Report, there were 89,000 refugees in the country, though this number may be underestimated. There are some 70,000 Palestinian refugees and about 150,000 recently arrived Iraqi refugees, but the number of the largest group, the Sudanese, is contested. The once-vibrant Jewish community in Egypt has virtually disappeared, with only a small number remaining in the country, but many Egyptian Jews visit on religious occasions and for tourism. Several important Jewish archaeological and historical sites are found in Cairo, Alexandria, and other cities. 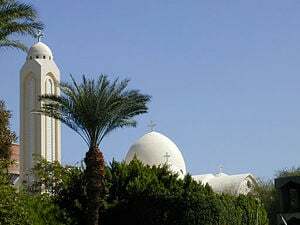 Religion plays a central role in most Egyptians' lives. The calls to prayer that are heard five times a day have the informal effect of regulating the pace of everything from business to entertainment. Egypt is predominantly Muslim, at 90 percent of the population, with the majority being adherents of the Sunni branch of Islam. A significant number of Muslim Egyptians also follow native Sufi orders, and a minority are Shi'ites. Christians represent 10 percent of the population, most of them members of the native Coptic Orthodox Church of Alexandria, which has a following of approximately 15 million worldwide; affiliated sister churches are located in Armenia, Ethiopia, Eritrea, India, Lebanon, and Syria. 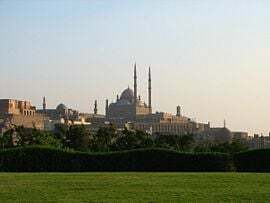 Al-Azhar University is the oldest Islamic institution of higher studies (founded around 970 C.E.) and is considered by many to be the oldest extant university. According to the constitution, any new legislation must at least implicitly agree with Islamic laws. Religious freedom in Egypt is hampered to varying degrees by extremist Islamist groups and by discriminatory and restrictive government policies. Being the largest religious minority in Egypt, Coptic Christians are the most negatively affected community. Copts have faced increasing marginalization after the 1952 coup d'état led by Gamal Abdel Nasser. Until recently, Christians were required to obtain presidential approval for even minor repairs in churches. Although the law was eased in 2005 by handing down the authority of approval to the governors, Copts continue to face many obstacles in building new or repairing existing churches. The Coptic community has occasionally been the target of hate crimes and physical assaults. Egyptian culture has five thousand years of recorded history. Ancient Egypt was among the earliest civilizations and for millennia, Egypt maintained a strikingly complex and stable culture that influenced later cultures of Europe, the Middle East, and Africa. After the Pharaonic era, Egypt itself came under the influence of Greek, Christian, and Islamic culture. Today, many aspects of Egypt's ancient culture exist in interaction with newer elements, including the influence of modern Western culture. When Egypt fell under a series of foreign occupations after 343 B.C.E., each left an indelible mark on the country's cultural landscape. Egyptian identity evolved in the span of this long period of occupation to accommodate two new religions, Christianity and Islam, and a new language, Arabic. Egypt's capital city, Cairo, is Africa's largest city and has been renowned for centuries as a center of learning, culture, and commerce. Egypt has the highest number of Nobel Laureates in Africa and the Arab world. The work of early nineteenth-century scholar Rifa'a et-Tahtawi gave rise to the Egyptian renaissance, marking the transition from medieval to early modern Egypt. His work renewed interest in Egyptian antiquity and exposed Egyptian society to Enlightenment principles. Tahtawi co-founded with education reformer Ali Mubarak a native Egyptology school that looked for inspiration to medieval Egyptian scholars who had studied the history, language and antiquities of Egypt. The Egyptians were one of the first major civilizations to codify design elements in art. The wall paintings done in the service of the Pharaohs followed a rigid code of visual rules and meanings. Contemporary Egyptian art can be as diverse as any works in the world art scene. The Cairo Opera House serves as the main performing arts venue in the Egyptian capital. Egypt's media and arts industry has flourished since the late nineteenth century, and today there are more than thirty satellite channels. Over one hundred motion pictures are produced each year. Cairo has long been known as the "Hollywood of the Middle East;" its annual film festival, the Cairo International Film Festival, has been rated as one of eleven festivals with a top-class rating worldwide by the International Federation of Film Producers' Associations. Literature constitutes an important cultural element in the life of Egypt. Egyptian novelists and poets were among the first to experiment with modern styles of Arabic literature, and the forms they developed have been widely imitated throughout the Middle East. The first modern Egyptian novel, Zaynab by Muhammad Husayn Haykal, was published in 1913. Novelist Naguib Mahfouz was the first Arabic-language writer to win the Nobel Prize in Literature. Egyptian women writers include Nawal El Saadawi, well known for her feminist activism, and Alifa Rifaat, who also writes about women and tradition. Vernacular poetry is perhaps the most popular literary genre among Egyptians, represented by such luminaries as Ahmed Fuad Nigm (Fagumi), Salah Jaheen, and Abdel Rahman el-Abnudi. 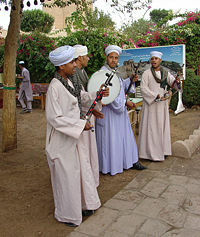 Upper Egyptian folk musicians from Kom Ombo. Photo compliments of Galen R. Frysinger. Egyptian music is a rich mixture of indigenous, Mediterranean, African, and Western elements. In antiquity, Egyptians were playing harps and flutes, including two indigenous instruments: the ney and the oud. Percussion and vocal music also became an important part of the local music tradition. Contemporary Egyptian music traces its beginnings to the creative work of people such as Abdu-l Hamuli, Almaz and Mahmud Osman, who influenced the later work of Egyptian music giants such as Sayed Darwish, Umm Kulthum, Mohammed Abdel Wahab, and Abdel Halim Hafez. These prominent artists were followed later by Amr Diab. He is seen by many as the new age "Musical Legend," whose fan base stretches all over the Middle East and Europe. From the 1970s onwards, Egyptian pop music has become increasingly important in Egyptian culture, while Egyptian folk music continues to be played during weddings and other festivities. Egypt is famous for its many festivals and religious carnivals, also known as mulids. They are usually associated with a particular Coptic or Sufi saint but are often celebrated by all Egyptians. Ramadan has a special flavor in Egypt, celebrated with sounds, lights (local lanterns known as fawanees), and so much flair that many Muslim tourists from the region flock to Egypt during Ramadan to witness the spectacle. The ancient spring festival of Sham en Nisim has been celebrated by Egyptians for thousands of years, typically between the Egyptian months of Paremoude (April) and Pashons (May), following Easter Sunday. The most important food item in daily life is the bread loaf. In rural areas, bread is usually baked by women in mud ovens at home. In cities, bread is sold in bakeries. The standard loaf is strictly regulated by the government in terms of weight and price. The indigenous cuisine relies heavily on legumes. The main national dish is foul. This is a dish of fava beans cooked slowly over low heat and seasoned with salt, lemon, cumin, and oil. It is usually eaten for breakfast. Another common dish is tamiyya or falafel, which is made from crushed fava beans mixed with onions and leeks and fried in oil. Also popular is koshari, a mixture of rice, black lentils, and macaroni covered with tomato sauce and garnished with fried onions. Consumption of meat depends almost entirely on wealth. While well-to-do households eat beef, lamb, poultry, or fish daily, less-affluent families eat animal protein once a week or even once a month. 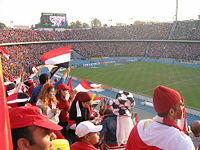 Football is the de facto national sport of Egypt. Egyptian soccer clubs El Ahly and El Zamalek are the two most popular teams and enjoy the reputation of longtime regional champions. People fill the streets when their favorite team wins. Egypt is rich in soccer history as soccer has been around for over a hundred years. The country is home to many African championships, such as the African Cup of Dreams. Squash and tennis are other favorite sports. The Egyptian squash team has been known for its fierce competition in international championships since the 1930s. Environmental issues are coming to the fore as Egypt develops. There is concern that oil pollution is threatening the coral reefs, marine habitats, and beaches. Pollutants such as raw sewage, industrial effluents, and agricultural pesticides are affecting the Nile, the main source of water for the whole nation. While the Aswan High Dam was built to control flooding, the river's water downstream from the dam is increasingly saline because the dam stops the normal flow of water from the Upper (southern) Nile. Furthermore, seepage and evaporation lead to a loss of 14 percent of the water that flows into the reservoir. Sediments from upstream are deposited in the lake, reducing the amount of storage capacity and forcing farmers to use fertilizer to get the same yields as when the river deposited its nutrient-rich sediments on their land. As a result of rapid urbanization, particularly around Cairo, agricultural land is being lost to apartment complexes. Population pressures and alleviating poverty are perennial issues. Although the incidence of poverty is decreasing overall, the number of poor people continues to increase as the population grows. Egypt has about 10.7 million poor people, and 70 percent of them live in rural areas. Most of the country’s rural poor people live in Upper Egypt, where there are higher rates of illiteracy and infant mortality, poorer access to safe water and sanitation, and larger numbers of underweight children. Women are particularly disadvantaged. About 80 percent of girls are taken out of school before the age of ten to do farm work. One of the greatest constraints hindering agricultural growth and self-sufficiency is availability of irrigated land. ↑ Population Clock. Central Agency for Public Mobilization and Statistics (16 April 2011). Retrieved April 16, 2011. ↑ Indicators From Final Results of 2006 Pop. Census Compared With 1996 Census (PDF). Central Agency for Public Mobilization and Statistics. Retrieved December 26, 2011. ↑ 3.0 3.1 3.2 3.3 Egypt. International Monetary Fund. Retrieved September 19, 2011. ↑ Egyptian military dissolves parliament BBC News, February 13, 2011. Retrieved August 20, 2013. ↑ Egypt's new president moves into his offices, begins choosing a Cabinet CNN, June 25, 2012. Retrieved August 20, 2013. ↑ David D. Kirkpatrick, Army Ousts Egypt’s President; Morsi Is Taken Into Military Custody The New York Times, July 3, 2013. Retrieved August 20, 2013. Adès, Harry. A Traveler's History of Egypt. Northampton, MA: Interlink Books, 2007. ISBN 978-1566566544. Asante, Molefi K. Culture and Customs of Egypt. Westport, CT: Greenwood Press, 2002. ISBN 978-0313317408. Cutter, Charles Hickman. Africa, 2006. Harpers Ferry, WV: Stryker-Post Publications, 2006. ISBN 978-1887985727.
de Blij, H.J., Alexander B. Murphy, and Erini H. Fouberg. Human Geography: People, Place, and Culture. New York, NY: John Wiley & Sons, 2006. ISBN 978-0471679516. Holmes, Martha, Gavin Maxwell, and Tim Scoones. Nile. London: BBC Books, 2004. ISBN 978-0563487135.